The picture is of the swan pit at the Great Hospital in Bishopsgate, Norwich. The Great Hospital was founded in the middle ages as a home for the elderly – a function which it still fulfils, although in the middle ages it was restricted the men of the church. 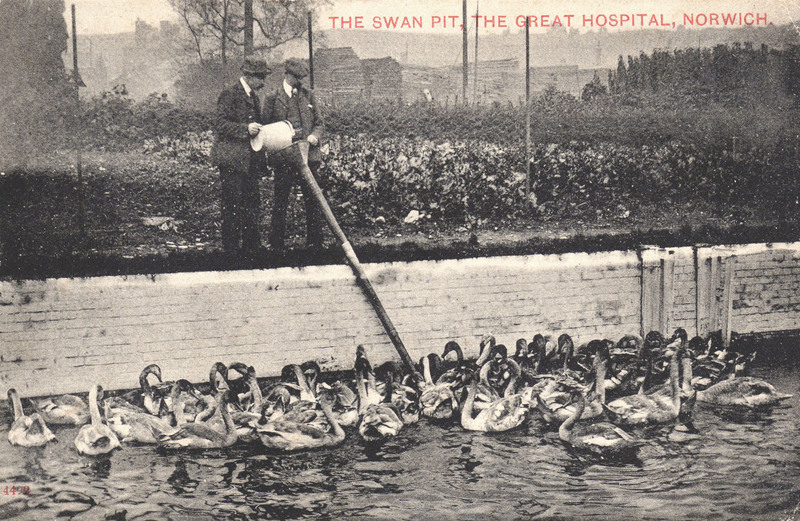 The current swan pit was built in 1793, but the tradition of keeping swans was started in medieval times when the Great Hospital was run by monks. The practice of keeping swans for the table only died out during the 20th century. It is remarkable to my mind that the ancient tradition lasted as long as it did, into the postcard era. 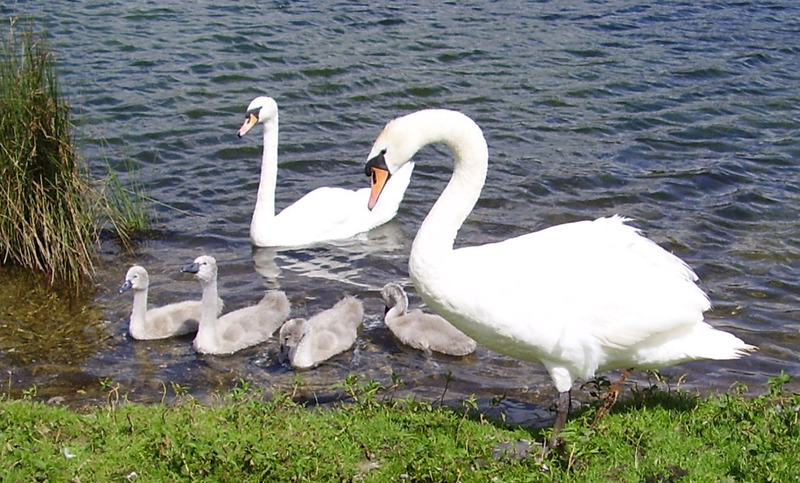 Norwich was the last place to keep swans for eating and the practice only ended during the Second World War, largely because of the problems feeding them at a time of grain shortage. The swan pit is still there, and still has water in it, but it has been empty of swans for around 70 years. It is fed by water from the adjoining river Wensum. A family of Broadland mute swans. The idea of eating these graceful and elegant birds strikes us as rather dreadful, but as you can see the swans had a much better life than broiler chickens in their cramped quarters and artificial light; and we never mind eating them in huge quantities. Basil Kybird, who had eaten a swan, which had killed itself by flying into power lines, reported that it was tough and tasted of mud. I do not think this taste and texture applied to the young birds that were raised at the Great Hospital. They were cygnets that had just become fully grown, so the meat would not have had an opportunity to become tough, and being fed on fresh grain (see picture) they would not have acquired the muddy flavour of bottom feeding wild swans. I am sure that the aged residents of the Great Hospital participated in the resultant feasting with pleasure. The tradition of gathering young mute swans to establish ownership survives in the ceremony of swan-upping on the river Thames, a tradition that dates back to the twelfth century. Then it was an important thing to establish who would own (and then eat) the birds, but now it is just a quaint tourist attraction. A swan was a valuable bird and was eaten at the very best tables, and the king was the principal owner of the birds on the Thames. A similar annual census of swans used to take place here on the Norfolk Broads. There is a Swan Roll from the end of the 15th century now in Norfolk Record Office with the swans’ heads illustrated in coloured pictures to show the marks placed on the birds’ bills by the various owners. There are 99 such outlines on 5 parchments. The Record Office also holds a swan roll made in 1837 by the vicar of Ingham near the river Thurne. There is also a record of the marks placed on the swans’ bills which is kept in the Refectory at the Great Hospital. It includes those used by the Hospital itself, which needed the swans to stock the swan pit. As late as 1938 a swan was sent at Christmas as a gift to the king at Sandringham, and others were sold to buyers from all over the country. You had to have a large range or oven to be able to roast a swan – most people could not fit such a large bird into their cookers. The cost of a swan was given as one pound and five shillings (£1.25p) in 1937, carriage was extra. They were sent live by rail in wicker baskets, rather as homing pigeons used to be until the 1950s. Apparently this was the last swan pit of many to operate in the United Kingdom. It is also the last swan pool to remain, and is a Grade II listed building. The designer was William Ivory the son of Thomas Ivory, both local architects. Thomas was the architect of many distinguished Norfolk buildings of the middle of the eighteenth century including the Assembly House and the Octagon chapel. His son William was the architect of the Norfolk and Norwich Hospital whose work may be still be seen in St Stehens Road.